University of Lucknow and approved by N.C.T.E, New Delhi. Teachers play a very important role in student’s life. It is to great extent, the teachers who decide the shape a student’s life will take. You become efficient in teaching subject of your specialization on the basis of accepted principles of learning and teaching. The course teaches you about the attitude and makes you skilled in coming up with innovative techniques. You become competent in understanding the psychological principles of growth and development and individual differences of the student you teach. B.Ed.-F.N.R.C/NCTE /F-3/ UP-1136/112 April -1-2005. As per N.C.T.E Norms., UGC, and first statute of Lucknow University. Prof. B.B. Singh(Principal) MA, Ph.D.
Mrs. Vijaya Rani Verma(HOD, DELD(B.T.C)) M.A., M.Ed. Mrs. Jaspreet Kaur M.Sc., M.Ed. N.E.T. Mrs. Divya Sharma M.Sc., M.Ed. N.E.T. Mrs. Shailja Sharma M.Sc., B.Ed., M.Ed. Ms. Arun Kumar M.A., M.Ed., N.E.T. Mr. Raj Kumar M.Sc., M.Ed., N.E.T. Mr. Ram Ajor Pandey M.A., M.Ed., N.E.T. Mr. Ram Kumar Yadav M.Sc., M.Ed., N.E.T. Mr. Ravendra Pal Singh Gangwar M.Sc., M.Ed., N.E.T. Mr. Raghavendra Singh M.Sc., M.Ed., N.E.T. Mr. Subhas M.A., B.Ed., N.E.T. Mr. Anoop Kumar M.A., M.Ed., N.E.T. Mr. Lal Sahab Yadav M.A., M.Ed., N.E.T. Mr. Manjeet Singh M.A., M.Ed., N.E.T. Mrs. Vijaya Rani Verma (HOD/Principal) M.A., M.Ed. Mrs. Anju Singh M.Com. M.Ed. Ms. Deepika Sharma M.A., B.Ed. Mrs. Vandana Devi M.A., B.Ed. Mrs. Vijay Laxmi Verma M.A., M.Ed. Mrs. Anita Kumari M.A., B.Ed. Mrs. Nandini Singh M.A., M.Ed. Mrs. Reeta yadav M.Sc., M.Ed. Mr. Sanjay Kumar M.Sc., M.Ed. Mr. Shashi Prakash Singh M.A., M.Ed. Dr. Shivakant Srivastava M.Sc. M.Ed. Ph.D.
Dr. Rajesh Verma M.A., M.Ed., Ph.D.
Mrs. Subhashini Tripathi M.A., M.Ed. Dr. Reena Srivastava M.A., M.Ed. Ph.D.
Dr. Anuradha Tripathi M.A., N.E.T. Ms. Shikha Dixit M.A., N.E.T. As per rule one short and one long tour is prescribed for B.Ed. The college has successfully arranged for educational excursion. challenge. 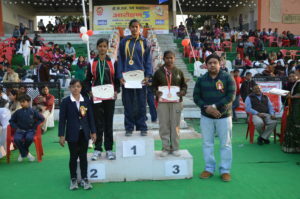 to meet this challenges, a two day “inter-colligate girls athletics meet-Aarohan” was organized in association with “We Can” on 7th and 8th Jan. 2010 at northern railway Stadium,Chabagh,lucknow. Promote the women in the field of sports. Strengthen the role of women in sports. Motivate maximum girls to participate. In the event, some sports veterans of international fame were present-Sri Ranbir Singh (Arjun Awardee) and Smt. Anna Singh-Ex. International Volleyball players, some other special dig nation of other fields were also present –Prof. Manoj Mishra,VC,Lucknow University,Prof. U.N. Dwivedi,Pro VC ,Luck now University.Smt. Sunita Airan, Editor Hindustan Times, Smt. Lalita Pradeep,Principal Diet, Dr. Birmati Singh, Director, Deptt. of Education, AMITY University, Sri Shyam Kishore Shukla.MLA Congress, Sri Naresh Agrawal, Industrialist. In the event,Khun-Khun ji girls p.g. college, Unity Degree college,M.B. college, Navyug kanya College, karamat Girls College, Shashibhushan Girls degree College, Times Business Studies, Awadh girls degree College, Luck now University, Public college of professional studies were participated with full zeal and enthusiasm. The meet was successful in the sense that despite of the chilly weather, a good number of participants participated in all the events. The college releases a magazine entitled as “Hastakshar” every year. 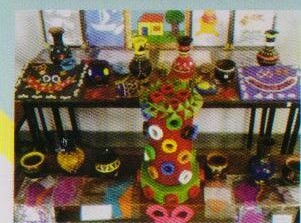 The magazine is designed by the college girls under the guidance of principal and teaching staff of the college. It provides the platform of express their creativity and potential .the college girls put their best efforts from planning to execution of the launch of the magazine. A one week seminar on gender inequality and female foeticide was organised from 23.05.2014 in the college campus. In this Seminar Ex-VC, Dean of Faculty of Arts, Lucknow Universiyt, Lucknow and Founder & Secretary of Saanjhi Duniya, Prof. Roop Rekha Verma was the Chief Guest. Since the establishment year of the college, it has been working for the promotion of women in different fields of society in association with an international campaign ‘WECAN’ that works and fights against any kind of violence against women .In this chain the college organized a ‘Slum Awareness Programme’ in haider canal, a slum area located near by the college where our girls and the staff members made a good attempt to create awareness among the local crowd about domestic violence and the measures to check it .In the same reference ,a lecture was also organized by Deepak Kabir, U.P coordinator of ‘We Can’ campaign in the college campus and our girls also participated in a ‘Kala Yatra’ organized by the ‘We Can’ campaign . Womens day week was Celebrated from 8-16 March, 2016. In closing ceremony, which was Organized by Bharat Raksha Dal Trust, prizes were given to the winners participating in different events held in college related to the international Women’s day. organized by the college on 1st and 2nd Aug 2009.the resource person of the seminar were Prof. S.K. Mohanty, Editor AIAER and Dr. Satyadev Singh.Prof. Nidhi Bala, Dept of Education, Lucknow was the coordinator and Dr. Kiranlata Dangwal, Lecturer, Lucknow University. Students research scholars and lecturers from different Universities, colleges of Lucknow,Kanpur,Varanasi,Meerut,Allahabad,Barabanki etc. places willingly participated in this workshop and gained a lot of knowledge proved to be very fruitful and of immense benefits for the participates.